A brand new on-line class for beginners to improver's to the craft curious alike! This single project course is perfect if you are looking to find a colourful/creative new skill, join a growing crafty community and are inspired by the idea of living a handmade lifestyle. This new on-line class is your chance to become part of a vibrant community of crafter's at different levels of expertise joining together to create a gorgeous and uniquely you crochet tote bag. From techniques to finished projects & styling, this project is bright, fun and overflowing with creativity. What's more, at the end of each section you will have learnt something entirely new! -A section dedicated to assembling & styling your awesome tote bag! Bright chunky cotton yarn is accompanied by fun work sheets and video tutorials to help you create your gorgeous new accessory design. Play > Learn > Pause > re-watch! This on-line craft class is jam-packed with delightful illustrated slides plus printable work sheets to inspire you along the way! It also includes gorgeous lifestyle shots to inspire your creative life. All course members are encouraged to share your new found skills with friends and join our on-line members-only community and share some more. Your chance to become part of a vibrant community of crafter's at different levels of expertise joining together to create a gorgeous and uniquely you crochet tote bag. 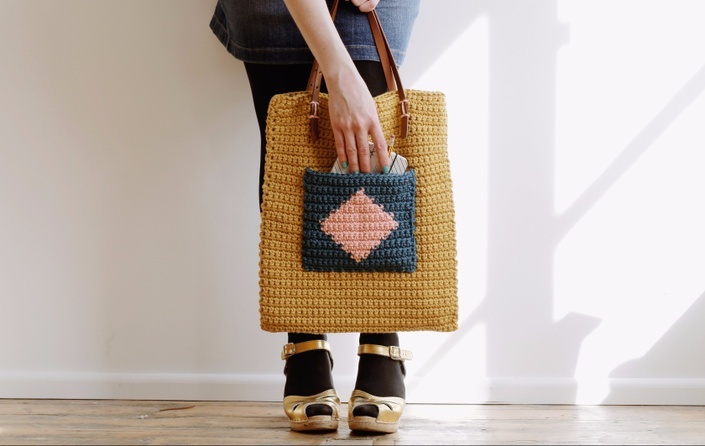 Crochet your own chic tote bag! An on-line class for beginners to improver's to the craft curious alike.